Shelter Dog Program | Modified k9 Inc.
We at Mk9 know that most dogs do not do well in a shelter/kenneling atmospheres, without proper stimulation and every day socialization. Unfortunately with the massive overpopulation problem, strays and owner surrenders a great number of pit bull dogs end up in these situations. Shelter volunteers and staff are limited as is and find it very difficult to keep up with the attention that a dog needs to stay content while in the shelter. We also know not everyone is able to foster or even adopt, so we have developed a program that will allow you to help better a life waiting for their family and make positive changes in our community. We have a small group of volunteers going into specific shelters that we are working with. Our volunteers make sure their partner shelter dogs stay active and content as much as possible while they wait for their families to find them. While in our program, our volunteers are helping the shelter dogs get "home ready" by working on their leash manners, basic obedience, socialization skills and mind stimulation exercises. Our volunteers make sure their partner shelter dog stays balanced and stimulated as they wait for their families to find them. While in our program, the shelter dogs are getting “home ready” by work on their leash manners, socialization skills and mind stimulating exercises. The pit bull shelter dogs we are working with will also come with a life time of guidance from Modified k9 for their new families. If you would like to join us with this shelter program and would be interested in being paired up with a pit bull shelter dog please send an email through our CONTACT US page. Title message "Shelter Dog Volunteer"
-Below are photos of the shelter dogs already in our program and they ALL need a home! -We need volunteers for this program. This program cannot work without dedicated volunteers to join us in helping these dogs. It is a sacrifice and can be time consuming, but we have lives that need us. - You must be 18 years of age or older with proof of valid ID. - You will be asked to sign a waiver. - You must have reliable transportation. - You must be able to meet up at the very least once per week. If you can do more that is outstanding!!! 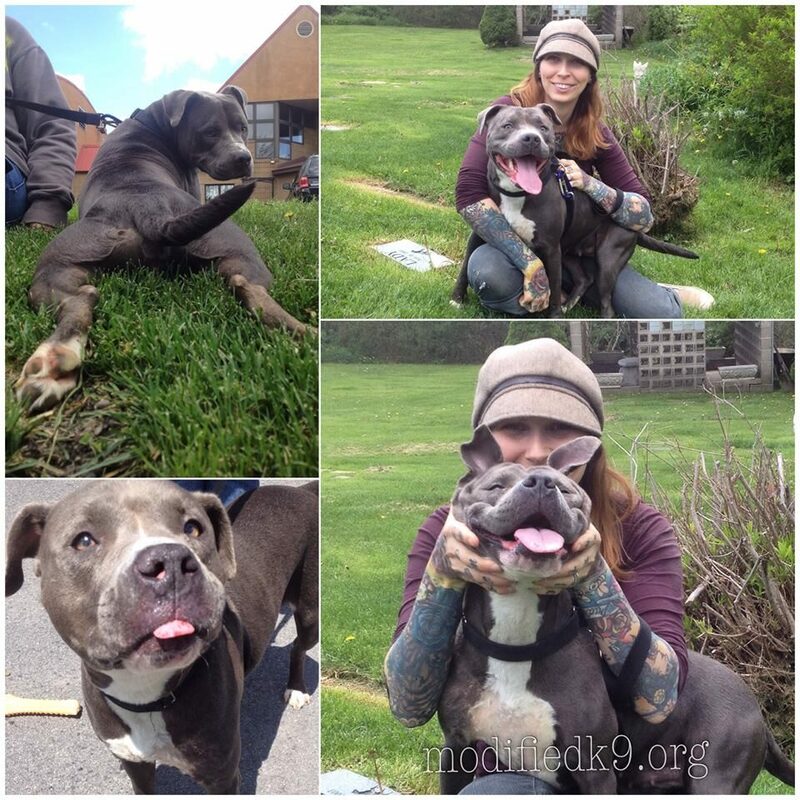 Annabelle is in need of a foster of foster to adopt located in Northeast Pennsylvania. This ever so sweet girl was pulled form a cruelty case and needs some serious lovin'.